Summary: Even after decades of study, much remains unknown about the juvenile years of green turtle life history. In Florida there appears to be a lack of individuals between 70 and 90 cm straight carapace length (scl). Using satellite telemetry to follow the largest juvenile green turtles as they leave nearshore developmental habitats provides valuable insight about migration times, routes and destinations that will allow managers to make important conservation and management decisions for this endangered species. Earlier tracked turtles have relocated to areas previously unidentified as green turtle habitat, and recruited to adult green turtle foraging grounds in the Florida Keys. Continuing this project will allow us to learn even more about these little-known size class animals. 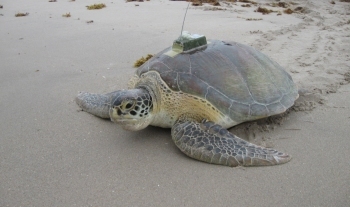 Satellite transmitters will be attached to the carapaces of immature green turtles of 70 cm or larger inhabiting inshore and nearshore developmental habitats of east central Florida. Satellite technology will allow us to learn more about when they leave local waters, their migratory routes and destinations. Results: All three turtles tracked by this project provided additional evidence that most subadult green turtles migrating along Florida’s east coast are likely heading for areas in the Florida Keys. All three animals tracked with this grant hugged the Florida coast as they swam south, following the same path as so many others before them. But when they reached the Keys, they took up residence in different, but not unexpected areas as compared to the 26 previously tracked turtles. Verne, for instance, relocated to an area off Duck Key, slightly less than halfway down the Keys. Other turtles had relocated to both north and south of Duck Key, but not in this particular area. The other two turtles were, however, also inside the reef line and in Hawk’s Channel, just as Verne. Hanna stopped her journey in an area nearly to the Marquesas Keys, but not quite. After continuing west past Key West, she relocated to an area just south of Ballast Key in the Lakes Passage west of Key West and eleven kilometers east of the nearest other transmitter turtle. Amelia swam all the way to west of the Marquesas and spent some time there before heading north and east, to arrive at an area due north of Bahia Honda Key, and 38 km SE of the nearest other transmitter turtle. Of the 29 turtles tracked, 25 of them stayed in U.S. waters. Eleven of these relocated to the Florida Keys. All but two of those animals remained inside the reef line and within the protected waters of the Florida Keys Marine Sanctuary. The other two moved into the Gulf, one very near Florida Bay, the other more than twice that distance out in open water. DNA results are not complete. The results for Verne were inconclusive. Hanna had a CM-A1 haplotype, meaning that she could have come from a Florida or Mexico nesting beach. Amelia was a haplotype CM-A3, which is found in Florida Mexico, Aves Island and Costa Rica.